What is In-Store Sales Promoter??? In-Store sales promoters attracts new customers and help the company to reach the revenue targets. The main aim of Sales Promoter is to make product presentations, answering to questions, approaching potential customers, and understanding customer’s needs and problems. People who want to be a Sales Promoter should demonstrate excellent communication and listening skills, observation spirit, selling abilities. It’s not mandatory for the person to have Higher Education diploma for this post. Sales promoters are charged with carrying out the tactical aspects of a marketing strategy in order to achieve key performance indicators or goals. 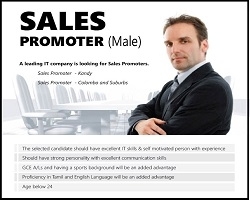 Basically sales promoter is a brand sales representative at a retail store. A In-Store sales promoters is employed by a product manufacturer or brand and deployed on the shop floor to maximize the sales of that brand. Sales promoters must maximize the company’s profit and expand the scope of the business. A sales promoter is also responsible for setting sales goals and then working towards meeting them in the long run. Sales Product consistently seeks new product knowledge to act as an expert for the customer. They provide honest and confident feedback to customers regarding merchandise style and fit. Product: Not only should a good promoter have extensive knowledge of the product, but they should also be familiar with the entire product line and the category of products that it falls in. They should also possess knowledge of competitor’s products. Placement: Good promoters will know where to best place their table for in-store promotions. Ideally, it will be located near the product and in high shopper density areas where your promo will be easily seen. The idea is to have your table “disrupt” the shopper on their shopping trip. Good promoters will also know the rules for the positioning of specific goods so that they are always in compliance with the retailer or venue they are operating out of. Price: Price knowledge is important, as customers will often ask about the amount of discount offered, the regular price of the product, and the promotional price. Price is a large factor in a customer’s purchase decision, so if you can prove that the discount you’re offering is a good deal or that your product is priced cheaper than your competitor’s, you have a better chance of convincing the customer to buy your product. Promotion: Most importantly, good promoters should be aware of all aspects of the promotion, from the advantages it provides to the customer to the marketing materials and point-of-purchase displays that have been planned for the promotion.